The Dr Rogo Bunion Splint is great for bunion toes, crooked toe alignment and big toe joint pain. Soothe your sore feet, ease foot pain and prevent bunion surgery. The Dr Rogo Bunion Pain Relief Splint is #1 in bunion treatment and pain relief. Relieve pain, protect and correct all in one splint. One size fits most (right or left foot). Easy to use – wear the splint around the house during normal activities. The soft cushion, straps and pad feel supportive and good on your feet. Designed to be so comfortable you’ll wear it more often. I have a variety of bunion care products and I love this bunion splint the most. I like the fact that it’s sturdy and that it has cushioning in the important areas providing ultimate comfort. I started wearing my splints to sleep because they are so comfortable and I sleep better with them. My bunions aren’t as bad as some people’s are, but they were paining me on a regular basis, especially on my right foot. I was searching for something that could help not only alleviate the pain, but perhaps help stop or slow what seemed to be a process of change in my feet. After sleeping with the Bunion Aid on my right foot for only a week or so, the pain disappeared. I’ve also used it on my left foot as needed. At this point I wear the Bunion Aid only after wearing tight shoes, high heels or if my feet have had a heavy work-out. I know it’s worked for me and I feel I may have staved off an uglier situation for my 53-year-old feet! The Bunion Aid is a great tool and I’m really glad to have discovered it! Bunions have made doing any kind of exercise without shoes on (or without those prescription insoles) mostly impossible because of balance issues. I don’t experience too much pain from my bunions, thank god, but they have made doing some activities pretty difficult, especially yoga, which has been the only form of exercise that I’ve ever enjoyed. Since I have limited mobility in my big toe, I can’t use it to balance like most people can, and this became a problem when I did yoga because I would just keep on falling over, and doing balancing positions seemed to make the bunion worse because it meant more time was spent in the misaligned position. This is where the Bunion Pain Relief Splint comes in. I started wearing it to classes, and it has made the biggest difference! I can balance, I don’t have to constantly re-position my toes, and the hinge offers enough rotation to do most positions comfortably. This bunion splint has done wonders for my painful bunions. 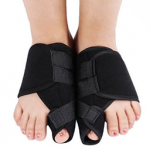 The bunion brace is very comfortable to wear and has a great grip on my bunions. I see major improvement in my bunion alignment! I have been wearing this brace at night for over a year and am experiencing a slow, yet, healing process. The pain in my foot is gone now. For the 2 years before wearing it, my foot pain kept getting progressively worse and worse. I attribute the healing in my foot to this brace at night, and wearing custom made orthotics in the day. The DR Rogo Bunion Pain Relief Splint seems to work well for me. I wear every night to relax tense parts of my foot. I find it comforting, and healing as well. I recommend it to those who suffer from bunion pain and want to avoid surgery. My bunions aren’t as bad as some people’s are, but they were paining me on a regular basis, especially on my right foot. I was searching for something that could help not only alleviate the pain, but perhaps help stop or slow what seemed to be a process of change in my feet. After sleeping with the Bunion Aid on my right foot for only a week or so, the pain disappeared. I’ve also used it on my left foot as needed. At this point I wear the Bunion Aid only after wearing tight shoes, high heels or if my feet have had a heavy work-out. I know it’s worked for me and I feel I may have staved off an uglier situation with my 53-year-old feet! The Bunion Aid is a great tool and I’m really glad to have discovered it. I was surprised that they worked so well and so quickly. They were delivered fast and were in the same shape as described. I have never worn corrective footwear, and these are really changing my forty-two year old feet. If I had worn this fantastic Dr Rogo bunion splint twenty years ago, I might not have had to have bunion surgery (which didn’t help at all). So I am very pleased! I am on my feet a lot during the day because I work in a doctors office and have bunions on both feet. I recently started getting really sore feet at the end of the day along with some other issues. I bought this Dr Rogo Bunion Relief Splint and wear it mostly at home and to sleep. After just a couple evenings and nights of wearing it, my toes have started to straighten out and there is a lot less aching in them and less pain in the rest of my foot.